Tidying up your things is not just piling them all up together. It requires time and organisation to avoid future problems. A long time ago, just after he created the world, God decided to take a day off. As all the animals were newly made and didn’t know what they should do, God couldn’t leave them on their own so he went in search of an angel to look after them. Even though he was a bit useless, Perico the little Angel so wanted to be with the animals and pleaded so much to be allowed to take care of them that God gave him the job. ‘Make sure they go to sleep before dark and are awake before dawn. We can’t leave the Earth empty!’ was the only advice God gave him. Filled with excitement, Perico went down to Earth and spent the day playing with the animals. He was so happy that it was nearly night time when he remembered that he needed to send the animals to bed. ‘Where do we leave all of our parts?’ asked the animals. They hadn’t had them for long and weren’t used to sleeping with their ears, beaks, claws, noses and feet, which they took off to go to bed. ‘I’m not too sure: just leave them there in a pile. Come on quick, it’s getting late’, Perico replied impatiently. Just before the last ray of sun disappeared, all the animals were in bed. ‘Wow, that was close. I got away with it’ thought the little angel. And then, very tired, he went to bed. He woke up just before dawn and hurried to wake the animals. ‘Come on! Get up! You need to put all your parts on and be awake before daybreak’. All the sleepy animals headed for the pile of ears, teeth and feet to get dressed. But the pile was such a mess and they were in such a rush that they couldn’t work out what belonged to each animal, so they all took what they could and got dressed quickly. Once again, they made it just in time, and a very relieved Perico, the little Angel, went for breakfast. Before he had finished his breakfast, a rabbit came up in tears. It complained that it had been bitten 3 times already. ‘Do you think these are big?’ said the little rabbit, pointing to his tiny frog ears. ‘Because this morning nobody could find anything in that huge pile’ interrupted an angry crocodile. ‘I had to put these beaver teeth in and now everyone is laughing at me because I can’t close my mouth’. ‘Stop moaning’ said the grumpy lion, ‘my penguin feet are even funnier’. More and more animals arrived with loads of problems: a monkey with a trunk, a hedgehog with feathers, a bird with a tortoise’s shell. 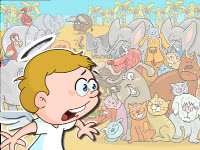 The angel realised that doing things in a rush and leaving everything in a pile had not been such a good idea, so he called all the animals together to propose a solution. ‘From now on, we’ll stop playing half an hour earlier so that each animal can go to a different place where they will have time to put their parts away. Rather than putting all the bits together, we are going to separate them into small groups, noses with noses, ears with ears, claws with claws, and so on. That afternoon, half an hour before sunset, the animals went off and each found a place that they liked. The fish went to the sea, the birds to the trees, jungle animals to the jungle, penguins to the South Pole … They left their parts in well-organised small piles and the following morning it didn’t take long to find them and get ready. God came back at dawn. Everything was perfect. Even though he was a bit hopeless, Angel Perico was also very honest and found the courage to tell God what had happened and the mistake he had made. In the end, however, God loved his little angel’s solution and the fact that each animal had its own special place. In fact, he liked the new arrangement so much that he decided to give Perico and the other angels a part from his favourite animal as a present. And that’s how Perico the little Angel, a great friend of birds, obtained the most incredible wings for all the world’s angels. Our little angel spent the whole first day playing, but to stop playing we must realso reserve some time: we have to pick up toys, or to change clothes, or to clean and have a shower... Do you figure out any other thing you should do after stop playing? And how about before playing? What have to be done before start playing in order to enjoy even more and avoid problems? Surely you can share with your children some funny personal experience about the outcomes of impatience and untidiness. While telling them, try to remark what you learnt. You should also explain that tidying up things can be a bit difficult because sometimes it is not clear what is the best place to set up each object, and this is a skill we get with some practice. The best way to approach tidiness in the family is to set up a place for each object. You can try to make a list with images or pictures of every object (or type of object), and the selected place for each of them. Every night you can check if everything is in place (list included!) and take note of the time saved that you can dedicate to family activities. Once you have saved enough time, you will be able to spend them to go out to watch a movie, to have dinner or whatever you like. A suggestion: start with a tiny list and expand it as you master it.